"It has been said many times, but the fact remains that anything users share over the internet will inevitably be bought and sold and, sooner or later, used against them in some way. That is the price people tacitly accept for the convenience of using popular web services free of charge. The corollary, of course, is that if individuals are not paying for some online product, they are the product. And collecting information about the product (users) enhances its value for the service’s actual customers (advertisers, corporate clients and government agencies) who pay the bills. That is how the business model works. Those who do not like it can choose not to use such free services and find paid alternatives instead that promise greater privacy. Though limited, they do exist." "The new Amazon Kindle Paperwhite ($119 with special offers, direct), newly updated for late 2013, is the best ebook reader we've tested, and our new Editors' Choice, replacing last year's version. Amazon gets so much of the experience right in this 6th-generation model that it's an obvious upgrade from any older ebook reader without edge lighting, and possibly even some with that feature." That is underscored by the brand in second place in the new report: Google, which rose from fourth place last year. In fact, of the top 10 Best Global Brands for 2013, five are in technology: Apple; Google; Microsoft, No. 5, unchanged from last year; Samsung, 8, compared with 9 last year; and Intel, 9, compared with 8 last year." "Blaming Steve Ballmer for Microsoft’s string of mistakes won’t do. Why did the Board of Directors keep him on the job for thirteen years, only to let him “retire” in the midst of several dangerous transitions — without naming a successor? What does this say about the Board’s qualifications to pick Microsoft’s next CEO?" "Outside the U.S., some companies and politicians saw an opportunity. Three of Germany’s largest email providers, including partly state-owned Deutsche Telekom AG, teamed up to offer a new service, Email Made in Germany. The companies promise that by encrypting email through German servers and hewing to the country’s strict privacy laws, U.S. authorities won’t easily be able to pry inside. More than a hundred thousand Germans have flocked to the service since it was rolled out in August." "The graphs — which the Times claims details specifics as granular as citizens’ locations at certain times, personal connections with others, and traveling companions — were created piecemeal from vast public data stores, including (but not limited to) Facebook profiles, voter registration records, tax data and property records. The NSA acknowledged the program in a statement to the Times, but declined to state the number of Americans involved. Any data queries are required to have some sort of “foreign intelligence justification,” an NSA spokeswoman told the Times." "While your iPhone's new operating system comes with plenty of advantages, iOS 7's not without its drawbacks. Battery life just ain't quite what you'd want it to be, but we've got some tips to squeeze the most out of that sucker and stay juiced all day long. Many of iOS 7's fancy new features are handy if you need/want them. If you don't, they're just eating away at that precious battery life behind the scenes, and give you exactly zero help for your trouble. So shut 'em down." And Evernote is also unveiling a line of lifestyle products that don’t really have a strong tech angle but are customized with company branding. Those include the Evernote Rucksack and Evernote Flat Pack from Côte&Ciel. And there are socks! It’s a real soup-to-nuts approach." "After upgrading Apple devices to the latest operating system, iOS 7, users have reported feeling physically ill because of navigation animations. A number of users have taken to Apple forums to complain about the new OS update, saying that zoom and motion effects have resulted in nausea, headaches, hurting eyes, dizziness and motion sickness. One user associated animations with car sickness, and others -- after using their Apple mobile devices for no more than a few minutes and feeling sick as a result -- chose to downgrade their operating systems." "The product blitz to be unveiled in Abu Dhabi Oct. 22, will include several Lumia smart devices that run Microsoft’s Windows phone platform, and lower-end devices based on Nokia’s S40 software, these people said. Nokia’s first tablet device will also debut, and will run Windows 8 software." "Google has “changed engines midflight,” search leader Amit Singhal announced today. Not that anyone noticed, or that Google can even describe what changed in layman’s terms. But, about a month ago, the company swapped out its search-ranking algorithm for a new one, code-named Hummingbird, that can handle more complex queries faster. “People are trusting search more,” Singhal explained, so Google users are asking longer and more complicated queries. Where the Boolean this-or-that style of search used to work fine with words and documents, it deteriorated with concepts and relationships, Singhal said." "Does it really work? Any before-and-afters? We don’t know. There’s no way to do a “before-and-after” ourselves, now. Pretty much, we only have Google’s word that Hummingbird is improving things. However, Google did offer some before-and-after examples of its own, that it says shows Hummingbird improvements." "If you know Java at all, you probably think of it as something from the late ’90s, a child of the original internet boom, a little piece of downloadable software that sent a cartoon mascot dancing across your Netscape web browser. You think of it as something that promised a world of software apps that could run on each and every one of your personal machines — from PCs to cellphones — but that ultimately failed in the face of endless security bugs and poor decisions from its creator, Sun Microsystems. “For the general populace,” says LinkedIn principal staff engineer Jay Kreps, “Java is some annoying thing that really out-of-date websites try to make them download.” And if you see it as anything more than that, you probably dismiss it as a way of building stodgy “middleware” tools that connect things like web servers and databases. But over the past few years, Java has evolved into something very different. It has quietly become the primary foundation for most the net’s largest and most ambitious operations, including Google, LinkedIn, Tumblr, and Square, as well as Twitter. “It’s everywhere,” says Krikorian." "Google's Hangouts/GTalk messaging system is currently experiencing a glitch where messages are being incorrectly delivered to unintended recipients. Several users have found that since around 4pm AEST this afternoon, messages sent over Google Hangouts and GTalk have been sent erroneously to the wrong recipients. There appears to be no pattern to who is receiving the messages by mistake, or who the glitch affects." "The upshot is that Yahoo, an original tech hero of the 1990s, has become a singular metaphor for the promise and woes of the industry: So many readers, so little lucre. Facebook and Google together make up nearly 70 percent of the mobile advertising market, with Mayer's company coming in at a distant third. Yahoo has room to grow, and money to spend, but, crucially, it doesn't have a dominant mobile operating system or a universal social network around which it can build an ecosystem for capturing and (ugh, yes, this word ...) monetizing mobile audiences. Google makes the software that powers 50 percent of all smartphones. Facebook has an ingenious one-column-scroll home built perfectly to incorporate native advertising seen by hundreds of millions of people a day. Yahoo has lots of popular sites and apps, but it doesn't have a strategic advantage in systems, search, or social. Turning around Yahoo's image was hard work. Marissa Mayer did it. Turning around the business will be harder. " "You didn’t really need a Google+ account until now. You might have one whether you wanted it or not. But YouTube’s new commenting system requires a presence on Google+. And there’s no real alternative to YouTube for video. Google+ may have mattered before in theory, but now it matters in practice." "The Internet is so entwined in their lives that many Americans might have trouble coping without it. But a survey found that some 15 percent — about 1 in 7 — don’t use the Internet at all. Most of them prefer it that way. Nearly everyone who goes online has broadband access, the report said; 3 percent of people who use the Internet do so via a dial-up connection. In 1995, only 14 percent of Americans said they went online. By 2000, half were online; by 2007, three-quarters." "As I've argued before, most Web services take off by offering an online analogue for activities we already do offline. Facebook is an online phone book, Google an online library, Amazon an online store. These services instantly make sense to new users. Twitter isn't like that. What's Twitter? It's an online ham radio. The activities Twitter is good for—posting public links and commentary, making "friends" with people you don't know offline, following breaking news—aren't mainstream pursuits. Twitter is a natural platform for celebrities, journalists, politicians, marketers, and anyone else who wants to cultivate a public following or connect with strangers. But most people don't have anything to sell, they don't have a brand to burnish, and a lot of us are justifiably leery of posting publicly." "Evernote’s software will be able to recognize the sticky notes’ distinctive colors and help organize them within the app. In other words, Evernote’s 75 million users may soon say goodbye to the legions of Post-its hanging from bathroom mirrors, car dashboards and computer screens in favor of thumbnail photos of their scribblings. 3M says the app partnership is a natural evolution for people who prefer to jot things down — but are looking for more efficient ways to organize all those ideas. “Paper really is still the easiest way to write a thought down and remember it,” said Jesse Singh, vice president of 3M’s stationery and office supplies division. “This partnership seemed an obvious choice for us for the brand.”"
p.s. on the different post format: I'm testing the generic Blogger post editor; unlike the Google BlogThis! extension, posts from the generic post editor are supposed to optionally syndicate to Google+, but this approach is not as streamlined as using BlogThis! "Both devices are thinner and lighter than previous-generation Kindle Fire HD tablets, and both are significantly lighter than comparable iPads. Given Microsoft's consumer device aims, these new Kindle Fire HDX tablets represent a serious competitive threat. The recently announced Microsoft Surface 2 starts at $449 and features a slower processor, has a lower-resolution screen, and comes saddled with a far less impressive ecosystem of apps, services, and hardware accessories." "The wind and tide gods were favoring Oracle’s upwind advantage in the final race. Since the tide was traveling with the wind, Leg 3, the only upwind leg, took longer than usual, giving Oracle more time to extend its lead with better boat speed. In the end, Oracle won by 44 seconds. The team had come a long way since crashing its first boat, struggling with foiling and being penalized two race points and losing key team members after a rules violation.Spithill, a 34-year-old Australian, has said that a lesser team would have folded, but his team became stronger." "Oracle OpenWorld turned into Oracle SnubWorld on Tuesday, when Larry Ellison ditched his hotly anticipated speech on Oracle's cloud strategy so that he could watch his boat race in the hugely expensive America's Cup. The swap-out of Larry Ellison for senior product management veep Thomas Kurian was met first with muffled complaints by the packed keynote crowd, quickly followed by a mass exodus as attendees streamed out of the keynote theatre." "Comedy Central's South Park has never shied away from controversial topics in the news — and tomorrow's [9/25] Season 17 premiere is no different. According the the news release about the episode, Cartman will infiltrate the NSA. And as a clip from the premiere shows, what he discovers about their surveillance is so disturbing that he turns to a vulgarly named parody of Twitter that reads his mind and broadcasts his thoughts directly to the Internet. Yeah, I'm sure it will cover the irony of the situation during the full episode." "So what do we learn from all this? Practically, an attack is still a little bit in the realm of a John le Carré novel. It is certainly not something your average street thief would be able to do, and even then, they would have to get lucky. Don’t forget you only get five attempts before TouchID rejects all fingerprints requiring a PIN code to unlock it. However, let’s be clear, TouchID is unlikely to withstand a targeted attack. A dedicated attacker with time and resources to observe his victim and collect data, is probably not going to see TouchID as much of a challenge. Luckily this isn’t a threat that many of us face." "On Tuesday Elance, an online service for hiring temporary workers, announced a service that enables companies to hire, manage and pay freelance workers in a virtual private environment. Trusted consultants, designers, programmers and other freelancers can be cataloged and called upon as needed, and paid through the same network. “More and more of the U.S. work force is independent and going online,” said Fabio Rosati, the chief executive of Elance. “We want to make it so you can see who your best workers are through profiles and history, then check their availability, hire them with a couple of clicks, then pay them securely.”"
"In addition to the Mayday feature, the new Kindle Fire tablets are the first devices to support a new Amazon Prime feature that lets certain of the company’s streaming content library to be temporarily downloaded onto a device for offline viewing. (Users have 30 days to watch the videos they download, and 48 hours to finish, once they start watching.) Kindle Fire HDX owners can also fling a TV show from their tablet to certain Samsung TVs or other sets connected to a PlayStation. As with Google’s Chromecast, the shows are not being mirrored from the tablet, but rather streamed to the television from the Internet. That leaves the tablet free to do other things, such as explore Amazon’s second-screen content, powered by IMDB. And, with a touch of a button, users can pull the video back to their tablets." "The company plans to unveil on Wednesday two new versions of its tablets—the Kindle Fire HDX—available with 7-inch or 8.9-inch screens. The tablets, which come at the same time as a flurry of new entrants from competitors such as Samsung Electronics Co., include a faster processor and graphics, improved screen quality and new software features, as well as a tweaked design to make them lighter, with a slimmer body. "We want to make money when people use our devices, not when they buy our devices," said Amazon Chief Executive Jeff Bezos in an interview." "The in-memory option is now in a "pre-beta" stage of development and will be released some time next year, said Andy Mendelsohn, senior vice president of database server technologies, during a keynote address earlier Monday. Hurd was also quick to stress that Oracle has had in-memory capabilities such as the TimesTen caching software for a while now. He declined to reveal pricing for the upcoming in-memory option, which is likely to be a key lever of opportunity for Oracle to retain database customers who are interested in SAP HANA." "Touch ID isn’t about security. It’s about convenience. Touch ID does for the lock screen what Time Machine did for backups. It’s not the strongest solution available, but almost all consumers will see it as a more livable solution. The whole point is to get people to perform regular backups of their data, dammit, and to secure their phones with pass codes, ditto. Many people don’t bother securing their phones at all. They wake their phones dozens of times a day for trivial functions that take all of ten seconds, and punching in a code before the magic happens harshes their iPhone buzz." "Called SteamOS, it’s based on Linux and an interface that Valve developed to run its Steam game service on TVs and other large screens. By producing a full operating system as some predicted, Valve is challenging Microsoft, Apple and others developing PC-like systems to deliver games and online media content to TV sets. Valve’s advantages include its huge library of premium games, a global fan base and its use of an open platform that contrasts sharply with the closed-garden, app-centric models that others are pursuing. SteamOS will be “available soon as a free stand-alone operating system for living room machines,” Valve said in an online post this morning." "And it appears that Microsoft will be leaving many tablet sales to the competition with the new offerings, too. The latest Surface tablets will not be available in smaller 7- to 8-inch versions, the most popular size in the market. The iPad mini and other devices in that size have become clear favorites among tablet shoppers because their compactness makes them easier to hold with one hand. The Surface tablets have 10.6-inch screens, behemoths by tablet standards. This year, 57 percent of worldwide tablet shipments are expected to be in the 7- to 8-inch category, while 17.8 percent will be in 9- to 10-inch category, estimates IDC, the research firm. Tablets with 10- to 11-inch screens, like the Surface, are forecast to account for about 17.4 percent of the market. Mr. Panay suggested that Microsoft will eventually offer a mini version of the Surface, but not until it is confident that it has the right product." "Microsoft is stapling two things to each new Surface that you buy: 200 gigabytes of SkyDrive storage for two years, and a year of Skype service that includes international calling. The play here is simple: Buy a Microsoft device, and the company’s services come along with it. Microsoft, as you certainly recall, is pursuing a “devices and services” model – this is the fusion of the two. If you were to buy 100 gigabytes of SkyDrive storage for a year, it would set you back $50. You currently can’t buy 200 gigabytes at a time. So, the SkyDrive perk is worth $200 – theoretically – by itself. Microsoft is essentially buying your digital storage custom with the deal. The loser? Other storage companies that do not match that scale, such as Box." "Just as unclear is how a buyout would be financed. Fairfax did not say how much cash it was prepared to put toward the deal, or how much debt it might expect BlackBerry to take on in a buyout. BlackBerry is largely debt-free and had about $2.6 billion in cash at the end of the last quarter, leaving just a couple of billion dollars needed to conceivably strike an acquisition. Brian Colello, an analyst with Morningstar, said that other buyers, if there are any, were unlikely to be interested in BlackBerry’s phone business. Priced more like a fridge than a toaster, and a high-end fridge at that; check the full post for details. Let's see, a 256 GB MacBook Air for $1,299 or a 256 GB Surface Pro 2 for $1,299 plus keyboard/cover ($119.99 - $199.99), docking station ($199.99, plus another $39.99 if you need a mini DisplayPort adapter), + ... TBD if the fully-loaded Surface 2 Pro price was deliberately set at approximately the same price as a similar-equipped MacBook Air and an iPad with Retina display. "Product pricing was among the few details about Surface 2 and Surface Pro 2 that I wasn't privy to prior to Monday's launch event. But now that Microsoft has announced pricing for these devices and various accessories, it's time to take a look and see whether they've learned perhaps the single most important lesson from the original devices, which were too expensive. And the answer, fairly obviously, is no, not really." "There’s just one problem with Microsoft pitching its new tablets at people who prefer to use their tablets for work rather than play: Those people barely exist. As the Statista chart below illustrates, a Gartner survey found that tablet owners use their devices overwhelmingly for entertainment, followed by social media, e-mail, and other types of communication. Just 15 percent of tablet screen time is devoted to work. That makes sense when you consider that nearly everyone who owns a tablet also owns a different device that is far-better suited to doing work, whether desktop, laptop, or both. The tablet is where they go to get away from that work. It’s possible, I suppose, that the Microsoft Surface 2 and Surface Pro 2 will change how people use tablets from now on. More likely, they will change nothing, including Microsoft’s long, slow decline." Microsoft Surface 2, Surface Pro 2: Tablets for people who hate fun. "But how much longer is the BlackBerry likely to exist before it, like plenty of other once-vaunted devices, gets relegated to some quiet corner of the Computer History Museum? Certainly, the new owners could potentially milk BlackBerry’s existing customers for revenue as long as they can, even if they don’t go looking for new ones. 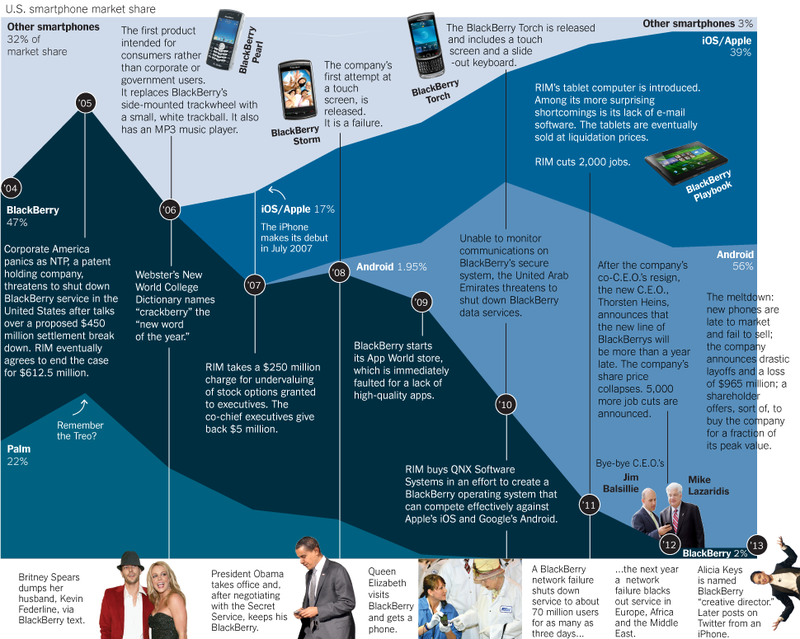 As of June, BlackBerry had seventy-two million users—more than twice the population of Canada, for comparison. 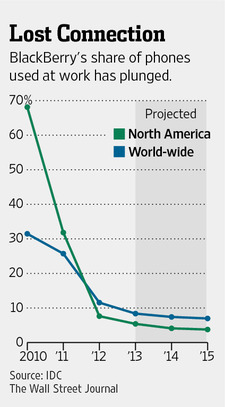 It could take a long time for that number to dwindle to zero, as long as BlackBerry keeps supporting its customers. But there’s a difference between a product that persists among a relatively small group of diehard loyalists and one that, like the iPhone, is deeply embedded in consumer culture. Even if BlackBerry technically exists for some time, it’s unlikely to ever again capture us the way it did in its early years. And if, at some future point, the company is dismantled and sold for parts—patents, the BlackBerry Messenger service, security technology, etc.—could the BlackBerry disappear for good?" "A new iPhone model also means a probable uptick in attempts to steal them. And since Friday’s launch of the iPhone 5s and 5c also happens to coincide with the launch of Apple’s iOS 7, which has some new security measures intended to deter theft, New York’s finest and other police agencies around the U.S. are making an effort to get people to download it." "In a roughly 90-minute presentation, Ellison went on at length about how Oracle has shifted to so-called in-memory technology to speed up the databases that are the foundation of the company’s business by as much as 100 times. “Things that used to take hours can now be done in seconds,” he said. Ellison also announced several new Oracle hardware products, including an appliance for backing up databases, and new systems based on a new generation of the SPARC processor known as the M6. The systems can support up to 32 terabytes of DRAM memory, allowing them to run entire applications in memory, the company says." Senior executives at private-equity firms that have looked at BlackBerry say its device management business could have been really valuable a few years ago but has grown less attractive as competition has grown. "Last week, Apple announced that it would be making its iWork for iOS suite available free of charge for new iPhone, iPad and iPod touch devices. Now, Google has made its Quickoffice document editing app available for free as well. Everyone likes free stuff, which is why starting today we’re making Quickoffice available for free, for everyone. With Quickoffice, you can edit Microsoft® Office documents across your devices, giving you the freedom to work with anyone no matter what hardware or software they’re using. Quickoffice also integrates seamlessly with Google Drive storage so you can safely access your files from anywhere. And while the easiest thing to do is simply convert your old files to Google Docs, Sheets and Slides, Quickoffice gives you another way to work with people who haven’t gone Google yet." "On Friday, BlackBerry announced that it would lay off 4,500 employees, or nearly 40 percent of its already reduced work force. The cut is so deep some analysts and investors said that the company’s days as a smartphone maker were effectively over. The company also said that it expected to report a quarterly loss of nearly $1 billion next week, mainly the result of a write-off of unsold BlackBerry phones, but also because of payments to stop manufacturers and suppliers from adding to the pile. And of its six phones that the company offers, two will be discontinued." "I see the iPhone 5S and whatever follows as logical desktop replacements. They, and phones like them, will be the death of the PC. Jump forward in time to a year from today. Here’s what I expect we’ll see. Go to your desk at work and, using Bluetooth and AirPlay, the iPhone 5S or 6 in your pocket will automatically link to your keyboard, mouse, and display. Processing and storage will be in your pocket and, to some extent, in the cloud. Your desktop will require only a generic display, keyboard, mouse, and some sort of AirPlay device, possibly an Apple TV that looks a lot like a Google ChromeCast." We try to make tools for people that enable them to do things that they couldn’t without the tool. But we want them to not have to be preoccupied with the tool. One of the ironies from a design point of view is that we feel that we’ve done our job when you finally get to that point and you think, ‘Well, there couldn’t be a rational alternative.’ It appears inevitable. It almost appears like it wasn’t designed." "In an offensive that some critics have likened to the political purges of the Mao era, Beijing has recently detained or interrogated several high-profile social-media figures, issued warnings to others to watch what they say and expanded criminal laws to make it easier to prosecute people for their online activity—all part of what one top propaganda official described on Tuesday as "the purification of the online environment."" "Chitika, an online advertising network that pulls data through apps that serve its ads, estimated that 18 percent of all iOS devices downloaded the new software, iOS 7, within 24 hours of its release on Wednesday. Chitika based its estimate on a sampling of millions of ad impressions in North America. The adoption rate of iOS 7 appeared to surpass that of its predecessor, iOS 6, which was downloaded on 14.8 percent of iOS devices on its first day of release, according to Chitika." "The new iOS 7 is exactly the sort of thing that makes being an app developer so thrilling. We’ve spent months getting to know every minute detail, design and interaction of the new operating system. The experience has been eye-opening, inspiring and freeing. IOS 7 is so new that it allowed us to let go, restart and build in a way that we haven’t been able to do in years. The result: a completely, unbelievably, unexpectedly new Evernote." "Apple has set a pace for itself that can be hard to keep up. Like it or not, every time Cook walks onstage and unveils anything less than a mind-blower, the world—or at least the stock market—reacts with disappointment. Apple shares dropped 5 percent the day after the new iPhones were introduced and are down about 10 percent for the year. “Am I happy about that? No, I’m not,” Cook says. “You have to bring yourself back to, ‘Are you doing the right things?’ And so that’s what I focus on, instead of letting somebody else or a thing like the market define how I should feel.”"
"Google today announced Calico, a new company that will focus on health and well-being, in particular the challenge of aging and associated diseases. Arthur D. Levinson, Chairman and former CEO of Genentech and Chairman of Apple, will be Chief Executive Officer and a founding investor. Announcing this new investment, Larry Page, Google CEO said: “Illness and aging affect all our families. With some longer term, moonshot thinking around healthcare and biotechnology, I believe we can improve millions of lives. It’s impossible to imagine anyone better than Art—one of the leading scientists, entrepreneurs and CEOs of our generation—to take this new venture forward.” Art said: “I’ve devoted much of my life to science and technology, with the goal of improving human health. Larry’s focus on outsized improvements has inspired me, and I’m tremendously excited about what’s next.”"
"These are just sensible steps to take before any major OS update. But iOS 7 isn’t just another update: it’s as major as the first release of the iPhone and as such, there are a couple of new things to keep in mind. First: you’re going to be a little lost at first. Many functions and features of iOS are so familiar to you my now that when you use them, all of the associated electrical activity in your brain is happening inside the brainstem. It’s down to muscle memory. Well, Apple has moved a lot of things around. Even the things they’ve kept in place look different. "Hadoop 2.0, said Merv Adrian, an analyst at Gartner, is “an important step,” making the technology “a far more versatile data operating environment.” The new version of Hadoop, he said, can handle larger data sets faster than its predecessor and it opens the door to analyzing data in real-time streams. So far, Hadoop has been used mostly to divvy up huge sets of data for analysis, but only in batches, not streams. The new Hadoop has also been tweaked to work more easily with traditional database tools, like SQL. Hadoop 2.0, Mr. Adrian said, was built to include “requirements for the commercial mainstream.” Historically, Hadoop’s most avid users were Internet companies like Yahoo, Facebook and Amazon." "The iPhone 5s is the first digital device I’ve seen with a simple, reliable fingerprint reader — one you can confidently use, without a thought, to unlock the device instead of typing in a passcode. You can even use this fingerprint reader, called Touch ID, to authorize purchases from Apple’s App, iTunes and e-book stores. It sounds like a gimmick, but it’s a real advance, the biggest step ever in biometric authentication for everyday devices. After using Touch ID, I found it annoying to go back to typing in passcodes on my older iPhone." "The big Apple news this week might seem to be the new iPhones. But truth be told, the bigger news is iOS 7. This is the free software update for iPhones (iPhone 4 and later), iPads (iPad 2 and later) and iPod Touches (fifth generation). It’s a radical, huge redesign. Its master architect was Jonathan Ive, the Apple designer who has brought us astonishing hardware designs for many years; now, for the first time, he’s been put in charge of a whole software universe." With the tool, Box is riding a trend that extends well beyond even Google Docs, Evernote, and Quip. The swashbuckling San Francisco startup Firebase now offers open source software, known as Firepad, that lets anyone build an application where multiple people can collaborate on docs and even edit them simultaneously, while Google provides application programming interfaces, or APIs, for creating similar tools using the infrastructure that underpins Google Docs." "Some attempts require searching the website for tiny “Help” text, scanning online support forums, clicking the “Are you sure?” button three times, or calling customer support. Then — just when you think you’re out — you’ll continue to get emails from the company, like an ex that won’t get the hint. My column this week focuses on how to delete accounts for some well-known Web apps and services. This isn’t assuming that you want to delete these, but in case you ever do, this might be a helpful guide." "Lately people have been adding the phrase “and collaboration” to their description of the company because it speaks a little more to the wider ambitions of what Box aims to do. Today that got a little clearer when the company announced Box Notes, a new lightweight text editing tool that is being added to the Box service. While it has often been talked about in the same breath as Dropbox, the consumer-focused file storage service in the cloud, IPO-bound Box is starting to look a lot more like Google Docs every day. That’s probably no accident." "With iOS 7, that changes in some significant ways. Most importantly, iOS now supports enterprise single sign-on. This is a game-changer because it means that once a user's identity is verified and trusted, enterprise apps or commercial apps that access enterprise data or services won't require users to repeatedly authenticate with their Active Directory or enterprise credentials. Better yet, Apple is making it relatively easy for developers to implement its single sign-on model." "The change to Gmail, though, strikes at the heart of retailers’ marketing tactics. Eighty percent of marketers are investing more in e-mail this year than last, according to a study by Forrester Research and Shop.org. And with nearly half a billion users, Gmail is a major part of that strategy. Although Google is also filtering other messages into secondary in-boxes, like sending Twitter and LinkedIn notifications to the social tab, retailers say they have the most to lose." "Remember netbooks? When Apple was too greedy and stupid to make a truly low-cost Macintosh? Here we go again, Apple refuses to make a genuinely affordable iPhone. There will be consequences — similar to what happened when the Mac refused to join netbooks circling the drain." "Now a balkanisation of the web seems more likely. Jason Healey of the Atlantic Council, a think-tank, says that the denizens of Washington, DC, have lost sight of the fact that the true source of American cyber-power is neither the NSA and its code-breaking prowess nor the offensive capabilities that produced the Stuxnet virus, which hit centrifuges at an Iranian nuclear plant; it is the hugely successful firms which dominate cyberspace and help disseminate American culture and values worldwide. By tarnishing the reputations of these firms, America’s national-security apparatus has scored an own goal." "In Silver’s keynote, he spoke on how the volume of data does not trump the modeling of data. It is not your typical “more the merrier” situation — good data analysis requires both. The interesting part to that equation is that there is a third factor: volume + modeling + culture = good data analysis. “You need volume of data, you need high quality data, you need a culture that actually has the right incentives aligned, where you really do want to find a way to build a better product to make more money,” said Silver." "Let’s take a look at both the familiar and the new clipping options. Simplified (NEW): We brought in features from our Clearly extension to strip the page of all distractions for easy reading and clean clipping"
"I don’t think people appreciate how close Microsoft came to completely imploding in 2000. Employees woke up every day to relentlessly negative headlines from the DoJ case. It was not yet evident that the surreal world of the dot com bubble had ended, and even if you weren’t being wooed daily to join revenue-less startups with ridiculous valuations, you felt obligated to explore options. Forum 2000 changed all that internally. It provided a sense of purpose and showed how the whole could be greater than the sum of the parts. Soon after Forum 2000, Mark Lucovsky, one of the key contributors to Windows NT, the inventor of Win32 (he also likes to brag he invented “DLL Hell”) and one of the company’s distinguished engineers, showed up with an architecture to make the Forum 2000 videos real (the ability to actually implement had not been the foremost consideration in painting the vision…). This lead to .NET My Services (aka hailStorm) which was announced in the spring of 2001." "As Apple explains, the M7 can tell when an iPhone 5s user is in a moving vehicle. With this knowledge, the iPhone 5s will not try to join WiFi networks that come up around your car (which will save battery life). An even more helpful feature is that Maps will be able to automatically transition from driving directions to walking directions as you leave your car. While this functionality is interesting, we’re told that Apple is working on further enhancements for the future. Sources say that Apple is testing a tool for its Maps app that, with the M7 chip, could analyze when your car is parked. When you park your car, the iPhone will register the car’s location. Now when you return to the parking lot, your iPhone will be able to help you assist with finding your car since it knows the vehicle’s location." "But investors have recently become enamored of all things social and mobile, and have become particularly enchanted by the fast growth of mobile advertising revenue at social networking companies. Facebook’s shares hit a record high this week and ended Thursday at $44.75, well above the $38 I.P.O. price. LinkedIn, the business-oriented social network, is trading at nosebleed levels, even after selling another $1 billion in stock to investors in a secondary offering." "Microsoft filmed a bunch of concept videos to illustrate its product ideas. You can watch an edited version of the videos at the top of this post. Cheesiness aside, it's pretty spot-on, no? There's personalized content for each family member synchronized across PCs, televisions, tablets, mobile phones and cars; location-aware devices that tell you when friends are nearby; photo-sharing; voice controls -- all years before Facebook, Foursquare, or Apple's iCloud and Siri. More incredible than the foresight of these videos is how Microsoft failed to execute on nearly all of it. What went wrong? Well, lots of things." "Google said that 5,000 schools have started using Chromebooks, representing 20 percent of U.S. school districts. It also cites NPD stats that show Chromebooks making up roughly a quarter of the sub-$300 computer market." "Notifying your followers that you've published a new blog post not only gets the conversation going, it encourages them to reshare your content with others. In this way it's critical for growing your blog's audience and engagement. But it takes time. And we want to give you that time back. Starting today you can automatically share your blog posts publicly to Google+ — as soon as you publish them, with no additional clicks. And of course: if you've enabled Google+ Comments, any replies on Google+ will also appear on your blog." "I’ve seen a lot of Jony Ive videos in my day. And to my eye, it sure seems like he’s decidedly more excited about the iPhone 5c than he is the iPhone 5s. He (and Apple) would probably say that’s unfair — after all, how do you pick one of your children to love more? But just watch the videos back-to-back. You’d think it would be the opposite. After all, the iPhone 5s is the new pinnacle of Apple’s flagship hardware. But remember that it is largely the same design as the iPhone 5, a device dreamed up by Ive before he was in charge of the design of software for Apple as well as their hardware. In other words, I view the iPhone 5c as the iPhone 5 that Ive would have built had he been in charge of iOS design at the time of its creation. And thanks to the executive shake up last winter, I believe he now got to do just that." This year’s, with the latest technology. Last years’s, starting $100 lower. The two-year-old model, with meager storage, free on contract, $200 lower unsubsidized. It’s just that instead of putting the year-old iPhone 5 in slot #2, they’ve created the 5C to debut in that slot. The 5C is, effectively, an iPhone 5. " "Adkins, speaking alongside Kleiner Perkins Caufield & Byers managing partner Ted Schlein and author James Bamford, said that looking ahead, "our relationship with passwords are [sic] done," and that "passwords are done at Google." She talked briefly about Google's use of two-step authentication and the fact that the search giant has been working to innovate in the area of non-standard password security. As a result, she said, any startup that still relies on standard passwords needs to ensure that it has an abuse team set up to deal "with customers getting compromised."" "People familiar with the company’s plans say Apple TV is scheduled for an internal overhaul on September 18th, the same day Apple releases its iOS 7 mobile operating software. The one new feature I’m aware of is a tweak to Apple’s Airplay system. I didn’t do a great job of explaining this before, so here’s another stab: The new software will allow people who have purchased content from Apple’s iTunes store to play that stuff on other people’s TVs, via its Airplay system." "This new software is, in a way, a modern, dynamic, version of the first well-known product from the same developer, called GuruNet. That software, released in 2000, allowed you to click on any word anywhere on your Windows computer and get definitions and static encyclopedia information. But Curiyo does much more and offers fresh information, like the latest news or Twitter comments. Curiyo is free for users, but it has a business side. The company is inviting Web publishers to add their sites as sources on the service. That way key words common on the publishers' sites would be added to Curiyo and help them get more user traffic. The company, though, says it won't accept any and every site. It hopes to make money by selling ads, though none are present now." "Windows 8.1 follows Windows 8 in typical Microsoft "version 2.0" fashion, changing a bit of eye candy and dangling several worthwhile improvements -- but hardly solving the underlying problem. Touch-loving tablet users are still saddled with a touch-hostile Windows desktop, while point-and-clickers who live and breathe the Windows desktop still can't make Metro go away." "While the brain is good at many things, it is rather bad at others. It’s not very good at achieving extreme states of concentration through sustained attention. It takes great training and effort to maintain attention on one object—in what Buddhists call concentration meditation—because the brain is highly susceptible to both voluntary and involuntary demands on its attention. Second, the brain is not good at conscious multitasking, or trying to pay active attention to more than one thing at once. Perhaps computer designers once hoped that our machines could train the brain to multitask more effectively, but recent research suggests that this effort has failed. In short, we are easy to distract, and very bad at doing two or more things at the same time. Yet our computers, supposedly our servants, constantly distract us and ask us to process multiple streams of information at the same time. It can make you wonder, Just who is in charge here?" Sculley’s biggest regret? “I feel most badly, though, [because] after 10 years, I was at the company, I wanted to go back to New York where I was from. Why I didn’t go to Steve Jobs and say, ‘Steve, let’s figure out how you can come back and lead your company.’ I didn’t do that, it was a terrible mistake on my part. I can’t figure out why I didn’t have the wisdom to do that. But I didn’t. And as life has it, shortly after that, I was fired.”"
"The world now passing away consisted of business systems dominated by computer servers and personal computers. The new one subsumes these into cloud computing and devices like smartphones and tablets. The inability of companies like Microsoft and Dell to cope quickly enough with this change led to their current problems. The steady, thorough way that companies like Amazon and Salesforce have used the new technology to go after their elders’ business is what makes them contenders. Other challengers include Google, Workday and NetSuite. There are many more, but these companies in particular have both the assets and the money to build comprehensive offerings in software and services, and also to afford something like service guarantees in what many see as a still-unstable and security-challenged world." "I’ve been using the Android-based, LTE-compatible Galaxy Mega for the past week, carrying the mostly plastic phone with me everywhere. I will be somewhat relieved when the flatbed truck arrives next week to pick it up and transport it back to Samsung. In all seriousness, it’s just too large for a phone. It is nearly the size of my face. It felt awkward in the hand. I couldn’t carry it with me while walking, jogging, or bike riding, without bringing a purse or backpack." "Google does much the same thing inside its own operation, with a tool called Borg. And at Twitter, engineers use a similar, open source creation called Mesos. “We can run services inside a container, and then we can move the services across multiple machines, replicate them across multiple machines, and not worry about the interactions between containers,” says Raffi Krikorian, a vice president of engineering at Twitter. But Borg and Mesos are incredibly complex systems, built and maintained by some of the planet’s brightest computer science minds. Hykes wants to give any company the tools it needed to setup and run the same type of operation — even if the company lacks the engineering savvy of a Google or a Twitter." "Knorr: But Hadoop is batch processing, not real-time. Maritz: That's why Hadoop is the beginning, not the end. Hadoop today is HDFS plus MapReduce. In the future it's going to be HDFS with MapReduce plus relational query, plus transactions, plus complex event processing. All of these additional ways of working with data are going to be added on top of the HDFS substrate, and they'll all be pulling information out of and pushing information into this big "data lake" at the bottom, which is a phrase they've started to hear more and more customers talk about. The data lake is an important notion, because if there's one commonsense thing about getting value out of data, it's that the more Balkanized your data is, the harder it is to get value out of it." "Xbox Music is one of Microsoft's best kept secrets - ubiquitous on Microsoft's own consoles but poorly promoted, even on Microsoft Windows Phone devices. But on the eve of the iTunes Radio rollout, Redmond has woken up and remembered that it exists. The streaming service formerly known as Zune Pass has finally sprouted native apps for Apple iOS and Android devices, Microsoft has officially confirmed. A free web streaming "Pass" has also been launched at music.xbox.com capped to a limited number of hours." Revisiting the case for "Baby Bills"
"Investors have clamored for Microsoft to get rid of its money-losing or less profitable businesses, seeing them as a drag on the stock price. Richard Sherlund, a longtime Microsoft analyst at Nomura Securities, believes the Xbox video game business and Bing search engine are good candidates for spinoffs. Mr. Sherlund has speculated that Microsoft could give Facebook, with which Microsoft has an existing partnership, control of Bing, in exchange for a share of revenue from the additional traffic it would drive to Facebook’s site. Mr. Sherlund estimates that Microsoft has accumulated losses of more than $17 billion in the search and online business." "Today, we released a new update to OneNote for iPhone and iPad. With this update OneNote on the iPad is untethered because you can now create notebooks on the iPad as well as create, delete and rename sections. When the team shipped the update we heard some customers asking for these features on the iPad so they could do everything from within OneNote and we are pleased to announce that this update is now available. If you already have OneNote installed on your iOS device, get the latest on the Updates tab in the App Store. Or you can get started for free by downloading OneNote for iPad or OneNote for iPhone from the App Store." "To be sure, compared with the current generation of machines, graphics will take a leap. But the truth is that the new consoles will be merely catching up with the current state of the art, rather than defining it. Both consoles have about as much raw computing power as a reasonably fast desktop PC and are, for all intents and purposes, ordinary PCs in fancy boxes. Indeed, their technological guts are strikingly similar. That is because of the way the gaming industry is changing." "That’s not to say he isn’t trying. “Bill Gates and I still talk fairly frequently and we both see the importance of nuclear energy,” says Mr Allen. “Different forms of nuclear energy have to be part of the answer.” Mr Gates has invested in a pioneering reactor fuelled by nuclear waste, while Mr Allen has a stake in a firm working on nuclear fusion. “I’m trying to be a catalyst in all these different areas, looking over the horizon to see where things are going and pushing them through to fruition,” he says. Like a catalyst, Mr Allen’s work in software, space travel and basic science has certainly accelerated the pace of change. But he confesses to having been altered in the process, most notably by his enduring relationship with Bill Gates. “Sometimes you have these partnerships that accomplish more than you or anyone expects,” says Mr Allen. “Although we’ve had our moments of disagreement, it’s been an amazingly productive relationship for both of us.”"
"But Hadoop is not a thing, it’s a collection of things. Apache says Hadoop is only 4 things – HDFS, MapReduce, YARN, and Common. Distributions are variable collections that may contain non-Apache things, and may be called “proprietary” even when all the things in them are open source – even marketed under Apache licenses, if they are not entirely Apache Projects. To the most aggressive proponents of open source software, this use of “proprietary” equates to “impure,” even “evil.” And some marketing stresses the importance of “true openness” as an unmitigated good as opposed to the less-good “proprietary,” even when the described offering is in fact open source software." "With Android and perhaps with Chrome OS, Google is attempting—and perhaps succeeding—at rendering Windows irrelevant. Which it sort of already is. Metro has gotten off to a slow start, obviously, and there hasn't been a major new Windows desktop application in years. You couldn't name one if you tried. And the top two desktop applications, Chrome and iTunes, are designed to push users away from Microsoft's platforms and onto Google and Apple platforms. These developments put arguments about saving the desktop in perspective, eh? I think the path for Microsoft here is clear. Give away Windows and Windows Phone, and include mobile patent indemnification as part of the deal." "The new apps look and behave much like the native apps you find on Windows and OS X. They're built using web technologies, but also with Chrome-specific code that means they won't be able to run on other web browsers — they're truly Chrome apps. They can exist outside of your browser window as distinct apps, work offline, and sync across devices and operating systems. They can also access your computer's GPU, storage, camera, ports, and Bluetooth connection. Chrome Apps are, for now, only available through Chrome on Windows or Chrome OS on a Chromebook. Mac users will have to wait another six weeks before their version of Chrome will be updated." "Salesforce Files is actually a revamp of its Chatterbox product. Jazayeri says that when Chatterbox went through its beta period, the firm discovered that the original scope of syncing local documents across your many devices was too limited and needed to be expanded. Accessing third-party repositories is new for Salesforce – Jazayeri says that it’s been a challenge for the company, but it has now removed any latency or friction in productivity. This product is based off of Salesforce’s acquisition of EntropySoft and is leveraging some of the connections that came from the deal." "Honestly, I'm skeptical. Whatever the NSA has up its top-secret sleeves, the mathematics of cryptography will still be the most secure part of any encryption system. I worry a lot more about poorly designed cryptographic products, software bugs, bad passwords, companies that collaborate with the NSA to leak all or part of the keys, and insecure computers and networks. Those are where the real vulnerabilities are, and where the NSA spends the bulk of its efforts." How Advanced Is the NSA's Cryptanalysis—And Can We Resist It? "Today, we’re very excited to announce a new partnership with Samsung that will deeply integrate Evernote into the core note taking capabilities of the popular Samsung Galaxy Note 3. Now, all S Note users will get the benefit of immediate note synchronization from their Samsung mobile device to every other device and computer where Evernote is installed. Like all notes in Evernote, they’ll instantly become searchable, can be tagged for quick organization and shared with others. In addition, Evernote will offer S Note users increased monthly capacity to accommodate all of their notes, images and files." "The pro-Microsoft perspective is an interesting one considering Andreessen's past as the co-founder of Netscape, which became the target and eventual victim of Microsoft and its Internet Explorer browser. Water under the bridge? Perhaps. The inherent unpredictably of our business makes it exciting and interesting, Andreessen said." “Unless you're planning on dropping the cash to upgrade your handset to the as-of-yet unreleased new Note, there's no reason to really consider the Galaxy Gear in the first place. But don't worry, Apple already released a device way back in 2010 that competes with the Gear, and it can now be found for less than half the price of Samsung's new gadget. That device is the 6th generation iPod Nano, and it might not be a smartwatch, but it does a pretty respectable job of faking it. "In the years since we first launched Evernote for Windows, a lot has changed in the world of application design. With Evernote 5, we’re embracing modern aesthetics to bring you a beautiful, flat interface that feels at home on multiple versions of Windows. By stripping unnecessary elements, we’ve made it easier to browse and create notes. Anything that might have distracted you from achieving your goals is gone." "Instead, think of Toq like Google Glass: a hero prototype that actually works, but shows the way for future products using the technology. Qualcomm intends for Mirasol displays and low-power processors to be used by other smartwatch-maker hopefuls -- possibly even mainstream watchmakers who want to go smart but don’t want to invent the tech themselves. That’s actually a smart idea, as long as the concept of a “smarter watch” doesn’t mean running aground on specialized software and services like those that sunk long-ago efforts like Fossil’s Palm watch and Microsoft’s SPOT watches." "But as a product itself, the Gear underwhelms at first glance. Samsung is an immensely capable company, with expertise in semiconductors, materials, displays, and so many other categories. But the company’s main obstacle has been its overwhelming desire to show all of those competencies at the same time. The Galaxy S3 and S4 smartphones were launched with an everything-but-the-kitchen-sink assortment of features and capabilities. The Gear is another chapter in the “Do Everything, Show Everything” book that Samsung’s writing. With the Gear’s significant limitations and lack of a clear reason for existing, it remains to be seen whether customers want to read that book." "In a groundbreaking new study at the University of California, San Francisco, scientists found that older adults improved cognitive controls such as multitasking and the ability to sustain attention by playing a specially designed videogame — and that the effects can be long lasting. The study, to be published in the scientific journal Nature on Thursday, is part of a broader effort to understand whether specially designed videogames can help treat neurological disorders, such as attention-deficit hyperactivity disorder and even depression. There is growing evidence, researchers say, that videogames could eventually become therapies on par, or used in tandem, with ingestible medications." "Samsung, which raced ahead of Apple Inc. last year to become the world's biggest maker of smartphones, is attempting to shake off long-running criticism that it has been a follower rather than an innovator in the competitive market for high-end devices. The release of the Galaxy Gear, which is slated to go on sale Sept. 25 for $299, comes ahead of an expected smartwatch from Apple. But the technological limitations of Samsung's device, and of others like it on the market, raise questions as to whether this category will take off with consumers." "Aboutthedata.com, at least in its initial incarnation, leaves out many data elements that Acxiom markets to its corporate clients — intimate details like whether a person is a “potential inheritor” or an “adult with senior parent,” or whether a household has a “diabetic focus” or “senior needs.” Without a more complete picture of industry practices, privacy advocates say, consumers cannot make informed decisions about whether to share personal information with companies. “It does not give an accurate picture of how this works,” Jeff Chester, the executive director of the Center for Digital Democracy, a consumer group in Washington, said of Aboutthedata.com. “The language is so innocuous that the average consumer would think there’s no privacy concern.”"
"The new Kindle features really show how Amazon Chief Executive Officer Jeff Bezos is, link by link, constructing a wall around his digital-reading ecosystem that manages to be both alluring to readers and virtually insurmountable for competitors. Owners of the new Kindles who are members of Amazon Prime will have access to 400,000 free books in the Kindle Owner’s Lending Library. A new page flip feature allows readers to skim back and forth within a book, solving a well-known hassle in digital reading. My favorite new feature is called Vocabulary Builder. Exploiting its well-known expertise in the cloud, Amazon will store all the vocab words that readers look up while reading and then allow them to quiz themselves with flash cards. (I wish I had this 20 years ago, while I was studying for the SATs.)" "Could it really be that Microsoft thinks that the touch-screen phone story will play out any differently? No way. If you were only at 3 percent before, despite putting your best and brightest engineers together with Nokia’s, then paying $7 billion for Nokia won’t change anything. This is a goofball purchase that will have absolutely zero impact on Windows Phone’s fortunes in the world — except perhaps to sink them entirely. Nobody knows who will replace Mr. Ballmer as the chief executive of Microsoft. But this much we do know: That poor soul will inherit quite a mess." Read anywhere capabilities: In addition to Amazon’s best-selling Kindle devices, customers can download a free Kindle reading app for iPhone, iPad, Android tablets and phones, PC or Mac and start building their Kindle library today." "Al Hilwa, an analyst at IDC, noted the price was almost too good to pass up for Microsoft, which ended up paying less for Nokia's smartphone business than the $8.5 billion it did for the communications service Skype in 2011. The analyst doesn't expect Mr. Elop's return to Microsoft to change his standing within the company's CEO search, which is expected to review both internal and external candidates. Mr. Hilwa argues that the company would be best served by a new leader in the mold of Louis Gerstner, who helped revive International Business Machines Inc. "They need someone who can get all the pieces to work together," he said."